Alfajiri Cliff Villa is built in airy Caribbean style and overlooks the Indian Ocean; it has an elevated position ensuring privacy with stunning views of the surroundings. Overlooking the Indian Ocean, the exclusive Alfajiri Villas offer outstanding views on the clear waters, intimacy & state of the art comfort. With African Style fine design, each villa has large verandas with huge hand carved sofas with cushions dominating the front of the villas & private swimming pools as well as various views and amenities to enjoy. The gardens are meticulously maintained and include many palms from the villa’s nursery. 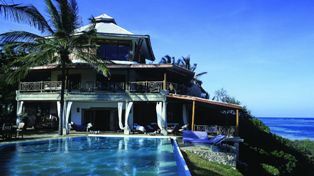 Located on Diani Beach at Mombasa's South coast, 35 km from Mombasa town. 8 guests can be accommodated in 4 bedrooms each with an en-suite bathroom, dining room, kitchen, lounge and a large verandah over looking the Indian Ocean.